Modern cars have a glued in windshield rear view mirror. But over time, regular glue gets old and falls off. The question arises: how to glue? Not to go with such a small change to the car wash! Do not attempt to glue mirrors universal instant adhesive. Use only two-component, special-purpose products purchased in the shop. Only those types of adhesives are able to withstand humidity, extremes of temperature and vibration while driving. Make sure that the product has not expired. Just in case make sure to always have a spare cartridge with glue of the same brand. Click on the windshield the place where will be located the mirror. Usually glue it in the center, equidistant from the driver and front passenger. 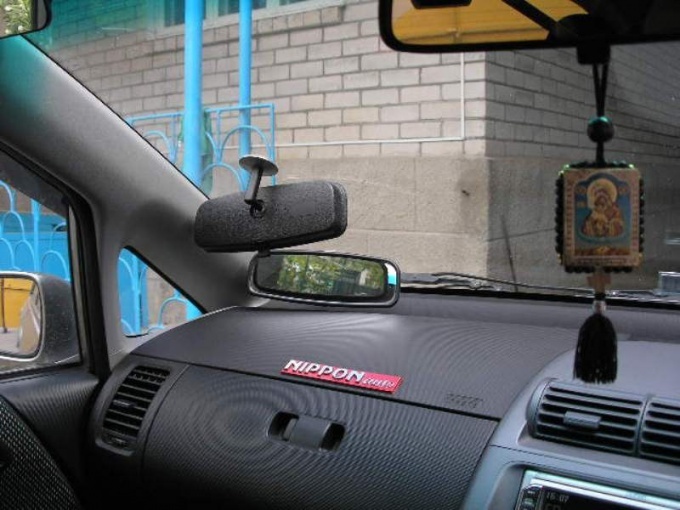 Also take care to place the mirror mounting is protected from direct sunlight and cold air flows. If the design of the windshield doesn't seal, don't put the mirror too close to the edge of the glass. When choosing a place of bonding, consider the location of the rain sensor and VIN (the glue should not get in the area of its application). Windshield and rear mirrors clean of dirt and residues of old adhesive, degrease with alcohol and wipe dry. Remove the mirror bracket and the holder. On the surface of the windshield glue adhesive marking tape-mesh in place of the mirror. To do this, find a special mesh in the kit to the glue. Cut out, attaching to the mirror. Try to the shape and dimensions of the workpiece as accurately as possible match by mirrorM. the Mesh-billet stick it on the windshield from the side opposite to the installation location of the mirror. Vigorously shake the primer and adhesive apply a thin, even layer on the reverse side of the mirror. If you are using the gun for extruding glue, hold it vertically, with a slight slope. Then press the mirror to the windshield, gently pressing down on him. Never mix different types of adhesives, working with a glass. Before attaching don't forget to wipe both surfaces with a degreaser and cleaner.